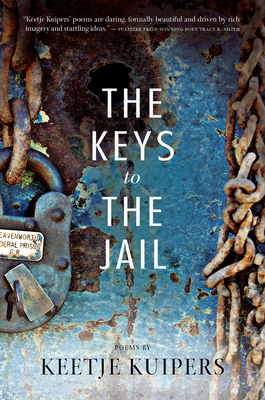 The Keys to the Jail asks the question of who is to blame for all we've lost, calling us to reexamine the harsh words of failed love, the aging of a once-beautiful body, even our own voracious desires. Keetje Kuipers is a poet of daring leaps and unflinching observations, whose richly textured lyrics travel from Montana's great wildernesses to the ocean-fogged streets of San Francisco as they search out the heart that's lost its way. of dark pigeons--who will take it from me? A former Wallace Stegner Fellow in Poetry, Keetje Kuipers's debut collection, Beautiful in the Mouth, won the A. Poulin, Jr. Poetry Prize. She has been the Margery Davis Boyden Wilderness Writing Resident, and is currently an assistant professor at Auburn University. Keetje Kuipers is a native of the Northwest. She earned her B.A. at Swarthmore College and her M.F.A. at the University of Oregon. She has been the recipient of a number of fellowships, including those from the Vermont Studio Center, Squaw Valley Community of Writers, and Oregon Literary Arts. In 2007 Keetje completed her tenure as the Margery Davis Boyden Wilderness Writing Resident, which provided her with seven months of solitude in Oregon's Rogue River Valley. She used her time there to complete work on her book, Beautiful in the Mouth, which was awarded the 2009 A. Poulin, Jr. Poetry Prize and was published in 2010 by BOA Editions. It contains poems previously published in Prairie Schooner, West Branch, Willow Springs, and AGNI, among others. You can also listen to her read her work--which has been nominated seven years in a row for the Pushcart Prize--at the online audio archive From the Fishouse. Keetje's second book, The Keys to the Jail, is forthcoming from BOA Editions in the spring of 2014, and contains poems previously published in American Poetry Review, Jubilat, and the Indiana Review. Keetje was a Wallace Stegner Fellow at Stanford University from 2009-2011, and she was the Emerging Writing Lecturer at Gettysburg College from 2011-2012. Currently she is an Assistant Professor at Auburn University where she lives with her family and their dog, Bishop (named after Elizabeth, of course).